PowerWall presenter running on HIPerWall, UC Irvine. 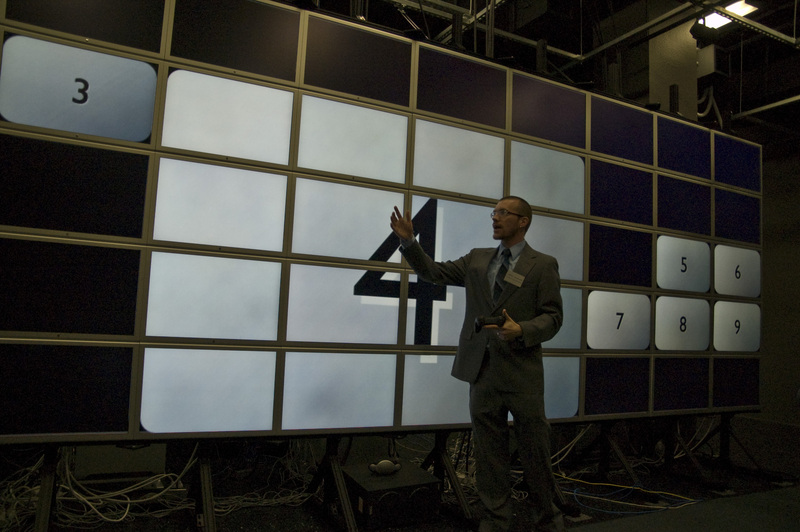 Calit2 is constructing ultra-resolution multi-monitor walls driven by clusters of computers. More than simply large displays, these walls can also process data on the supercomputer scale. They are, in fact, a new medium where supercomputing meets supervisualization. We are investigating how this new medium can be used for academic research, presentations, and teaching. If Powerpoint has become the stadard presentation technology for the current generation of single-screen displays, what new presentation strategies are possible on a HIPerSpace - 287 megapixel display wall (35,640 by 8,000 pixels, 31.8 feet wide x 7.5 feet tall)? PowerWall Presenter project is a colloboration with HIPerWall (Highly Interactive Parallelized Display Wall) research team at Calit2-Irvine, and Graphics, Visualization and Virtual Reality Laboratory (GRAVITY) at Calit2-San Diego which developed HIPerSpace - currently the highest resolution scientific display system in the world. We are developing the techniques to use HIPerWall and HIPerSpace as presentation spaces in lectures and discussions, as well as for display of Cultural Analytics projects.